Ring News 24Boxing News Breaking Boxing NewsChris Eubank Jr vs George Groves – Who is the stronger puncher? Eubank could conceivably still make middleweight but the lure of the riches at super-middleweight coaxed him up a division. He recently posted a video of himself weighing in extremely light for someone in the 168lbs class and this factor could have a bearing on the fight itself. While Eubank Jr may possess blinding hand speed, a sparkling uppercut and excellent fitness, how will he fare when a big puncher with a solid frame like Groves catches him clean? Groves, for me, is clearly the bigger puncher in this fight and it is likely that the Londoner will be touching 185lbs around fight night. Eubank Jr has looked impressive in his wins over Renold Quinlan and Arthur Abraham but Aussie Quinlan was a nobody and Abraham well past his best and content to tuck up and survive. It was more a case of claiming the moral victory of not being stopped rather than actually winning for the cagey German-based veteran. Quinlan has also gone on record since their IBO clash to say that Eubank Jr did not punch especially hard. Chris is more of an accumulation puncher who overwhelms his opponents with activity and a formidable work rate. Turkey’s Avni Yildirim was impressively dispatched in the third round of their WBSS quarter-final after not being able to live with the ferocious assaults of Eubank Jr. While it was a quality hook that eventually put ‘Mr Robot’ down and out, it was the unrelenting nature of Eubank Jr’s flurries that Yildirim was unable to defend against, as numerous unanswered punches flew in from all angles. What if somebody can take Eubank Jr’s shots and fire back while he’s throwing? What if someone can push him to work hard at their pace for 12 rounds and not allow him to work and take rests at various stages? How will the Brighton fighter cope with a solid telephone pole jab and raking body shots from a true super-middleweight? These are all questions that will surely be answered on February 17. The high profile duo traded verbal barbs at a predictably heated press conference. 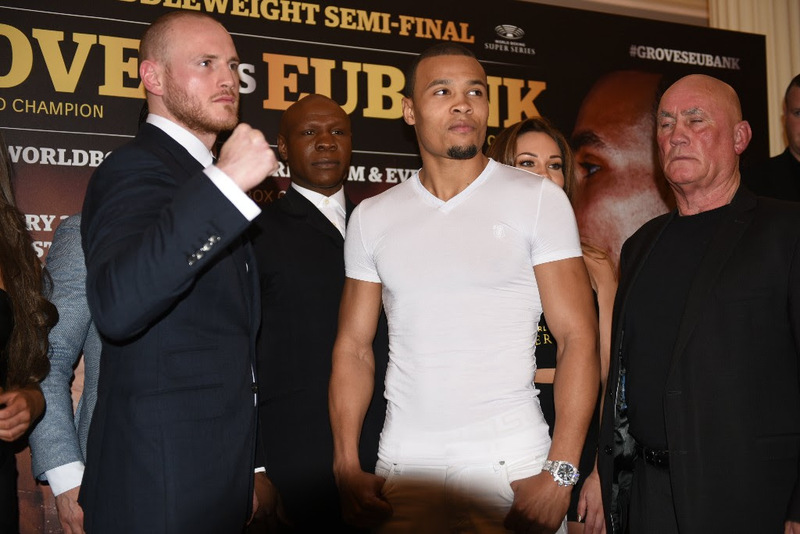 Groves retorted: ““Eubank’s camp are totally deluded,” Groves said. “He is fighting in a division he doesn’t belong in. He is a middleweight who punches from his hips with his chin up in the air. He’s terrific for a soundbite,” he said. For proof of Groves’ heavy hands look no further than the opening round of his 2013 blockbuster with Carl Froch. There were of course mitigating factors around this bout as pre-fight trash talk had ramped up the tension and arguably coaxed Froch into meeting centre ring with his brash foe to engage in a firefight. Either way, Groves found a home for the big counter right hand and deposited the champion heavily enough to verify his punching power. Paul Smith also tasted the Groves power in 2011 when an arcing right hand found its way around Smith’s left hook and dropped the Liverpudlian heavily before a follow up barrage finished him off. Fedor Chudinov and Jamie Cox are the latest two boxers to sample Groves’ punching power with the latter copping a tasty body shot last year as George motored through his WBSS quarter-final to set up this duel with Eubank Jr. Therefore, there is no doubt in my mind that Groves is the stronger puncher of the two and that could be a huge factor in this bout.